I make some really yummy things to eat, even now that I am a diabetic and have changed my eating habits so that I can keep my fingers and toes and such. But overall, I’m just an OK cook. My Dad and my brothers are people who really love to cook, they really show their love to others through their cooking. My Dad wakes up every day thinking about what he and Mom are gonna eat for dinner, which – given that my mother takes a fair amount of time & caffeine to really “wake up”- has led to 50 years of him accosting her most every morning, right when she gets up, and demanding to know what she wants for dinner, which leads to a very blank and confused expression on her face that I find pretty hilarious these days. Of course, Mom’s not wearing the hat or the beard….. If you click on the picture, you can see it better. I’m just happy to have a reminder of what’s going on foodwise each day. Studmuffin would rather eat chicken than almost anything else on the planet, ‘cept maybe chocolate ice cream, so that’s why there’s so many “Chicken Somethings” in the plan. I have a lot of cookbooks, for someone who’s meh about cooking, so I put in “Use a cookbook” in hopes that I might try something new; it could happen. My favorite innovation here *has* to be “Pantry Roulette” – go into the pantry and see what interesting thing could be made from what’s there and the older the better. Please feel free to try this out yerself, or put in the comments how you deal with the daily grind of ‘what’s for dinner?’ BTW, it’s Crockpot Chicken Teryaki tonight. See? Workin’ already. ** If you don’t know what Blue Apron is, go to the website and check it out. I have some free meals from them to give away; let me know if you want to try Blue Apron in the comments section and if you live in the USA, I’ll send them your way. Singing with the band Kaleidoscope & becoming a much better keyboard player because the fellas let me play more and more, singing with One Human Family Workshop choir twice, been married to Studmuffin for TWENTY-EIGHT years, traveling to Dayton with Studmuffin, traveling to WV for the Studmuffin family reunion, the Force of Nature graduated from high school – in the top twenty of her class, taking the Force of Nature to Marion Military Institute for college, the Duke of Curl spent part of the summer working in Colorado, he came home and now is in school AND has a job, paid off a fairly large loan, going to Birmingham several times for Baha’i Ruhi Institute training, YARN! FABRIC!……there’s been good things, many good things. The day after I wrote the previous post (The Gardening groove…) on this here blog, June 1st, my beloved dog Boris suddenly died. His sister Natasha has been ill/dying with a chronic parasitic infection for the last 3 years and we thought for certain, she would be gone first. We know their deaths are coming – they are 13 or 14 years old, and for their kind of dog to make it past 15 is quite rare, so we know it is gonna happen within the next 2 years certainly. Natasha, whom I have nicknamed “the Crypt Keeper” because she looks so bad – patchy fur, flaking skin and so skinny – is still living and quite happy. She gets all the treats now. I think he ate something he shouldn’t have – probably some poisonous vegetation. He always loved to eat leaves and green things. I planted zinnias every year, not because I’m fond of them, but because Boris loved to nibble the leaves so much. Others have told me that Labradors tend to get stomach cancer and that is possible, too. I did not realize just how sick he was until about 2 hours before he passed away; I spent about 5 or 6 hours that day driving the Duke of Curl to and from his dr.’s appointment in Birmingham; I would not have done that had I known that Boris was dying. We buried him next to Bluto^^ that night, and a week later I planted zinnias on his grave. We won’t be getting another dog while Natasha lives; she’s elderly and sick, but she was the less dependent of the 2 and I think adjusting to a new dog would be hard on her. I will rescue more dogs after she’s gone, mainly because of this video: Shy Shelter Dog gets Adopted. But it will be a while. Emmy the cat was sick this last week with a bad cold and it brought it all back. Boris was the dog of my heart and life is really not the same without him for me. I am reminded of him everywhere in our house and yard and all the streets nearby. It’s been nearly four months and I’m still grieving, which of course, I have mixed feelings about. There are so many terrible things happening in the world all over, and I’m crying about a dog. A dog who had a seriously wonderful life, who I was privileged to have in my family since he and Tasha were 4 months old. All I can say is that grief is the price of love and buddy, your death is costing me a fortune. You were the BEST dog for me and none of us will ever forget you. Thank you Borisman. Posted in Bluto, Boris & Natasha, food, funny, giveaway, Meal plan Monday, pets, soapbox, Under the weather, weather, whinge and tagged Bluto, Boris & Natasha, death of a pet, grief, illness, sick, summer bummer, virus, whinge on September 27, 2016 by helenkosings. 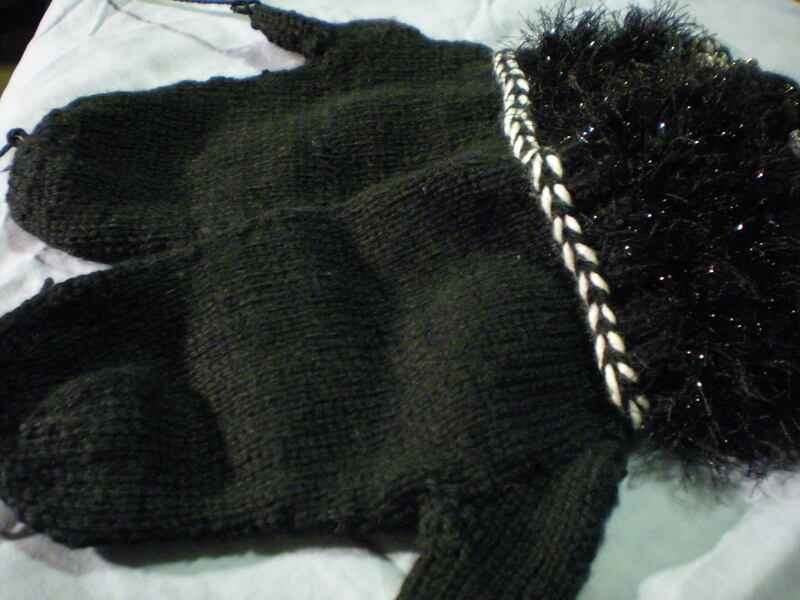 The cabled tam from Vogue Knitting’s 2008 Holiday issue for my best friend, Tangela. 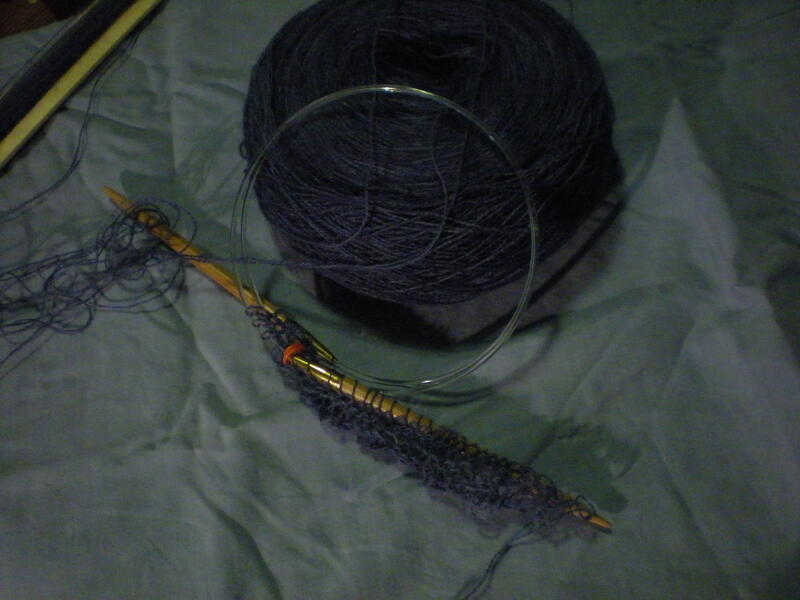 I’m modding it by making it even bigger – more increases and bigger needles. 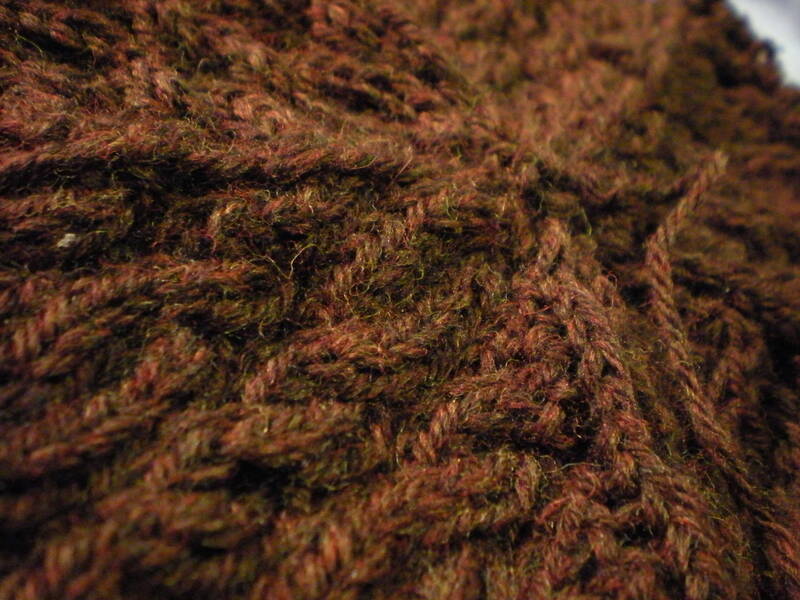 Yarn is Cascade 220 heather in some shade of brown (can’t remember what it’s called). First picture is more color accurate. Second picture is me messing around with my new-ish camera and all those settings I’m not really sure how to use…. 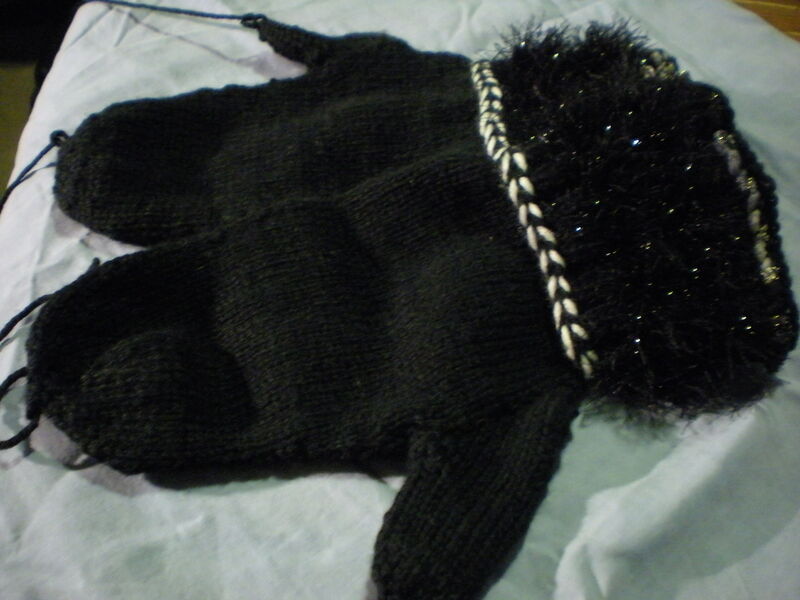 Sonya’s Bling-a-licious mittens in Rowan Cashsoft DK. I will be embroidering or duplicate stitching white polka dots all over these. They’ll be very “woo woo” when complete. 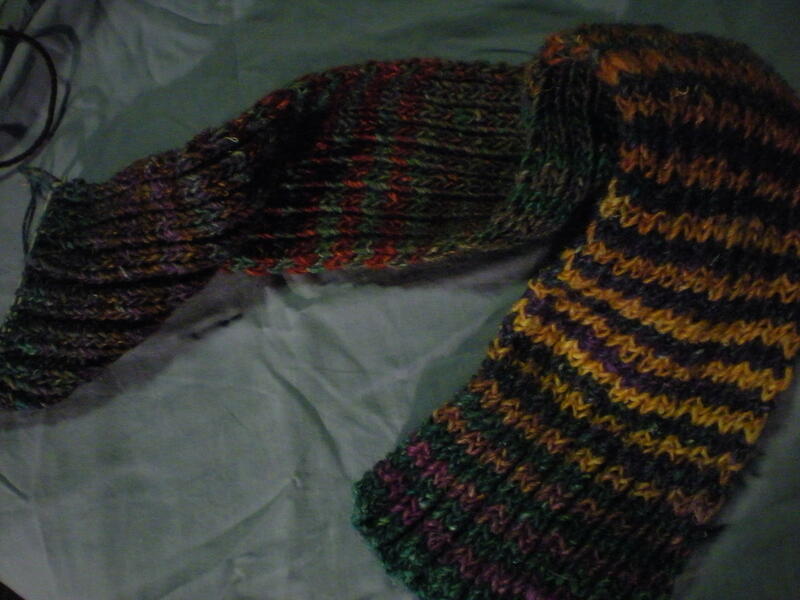 Noro Silk Garden Stripe Scarf number 3. The yellow doesn’t glow quite as much in real life…. What is it? It is yet ANOTHER swatch in alpaca laceweight for a test knit for Mme. Landry. It is to be a hoodie in my size (read: enormous). 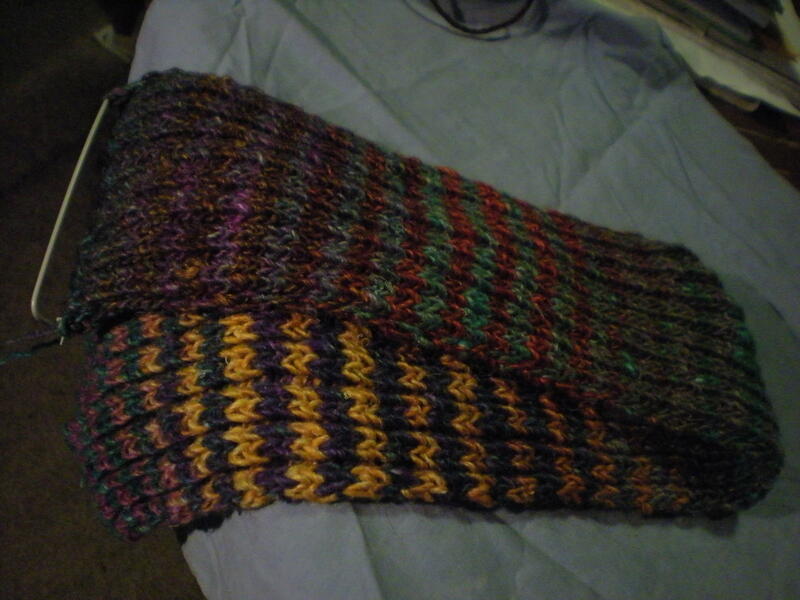 I’ve been through the seven circles of Hell swatching this mofo (that’s right, I said it) and am beginning to wonder if this is the right project for me. Just sayin’…. Major kudos to Franklin Habit for the mention on The Panopticon. I wonder if I can put “Vice President of Propaganda” on my resume? If you like, you can see my rather average mug in the picture collage – I’m on the bottom – extreme left. Franklin is a real gentleman, delightful and funny, and if you don’t go buy his book I’ma have a fit – I promise! 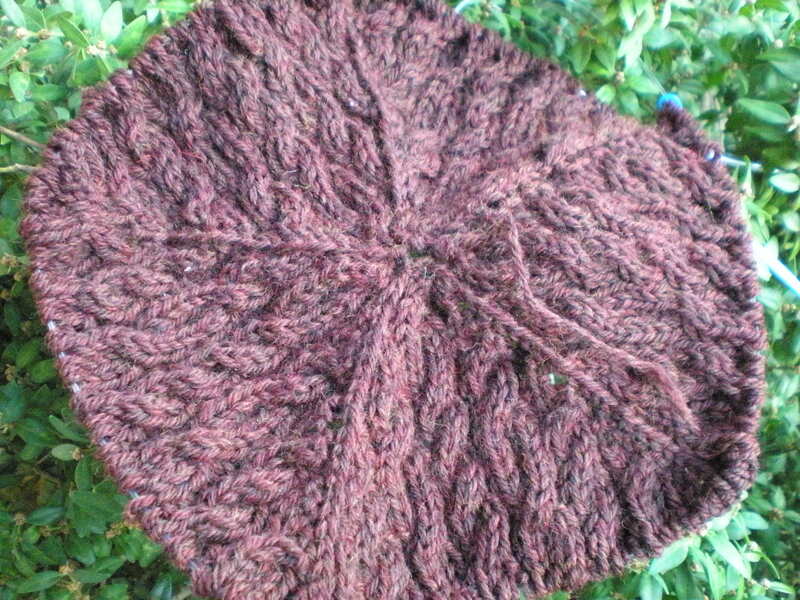 I did forget to tell him of the added bonus that came with his Dwarven Battle Bonnet – the pet hair that is a part of everything I knit. 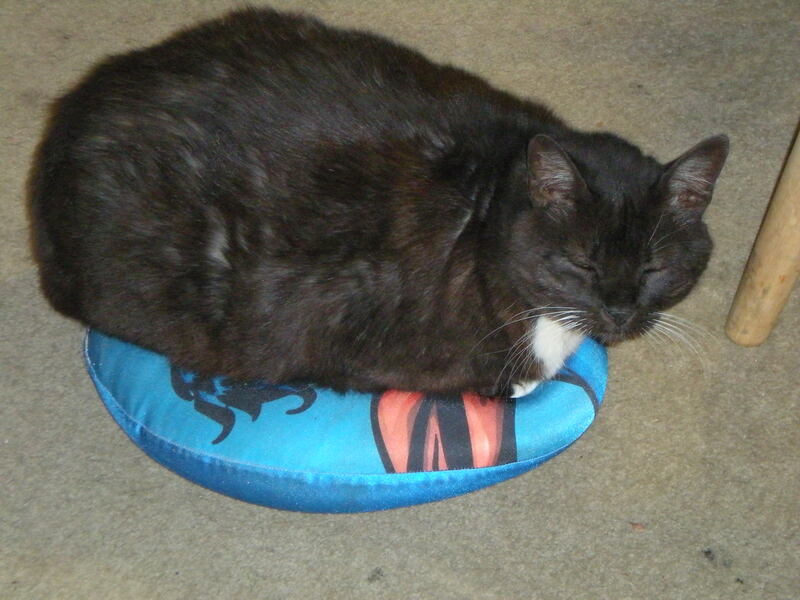 That’s a Superman travel pillow that some wonderful kid that lives around here left on the floor. 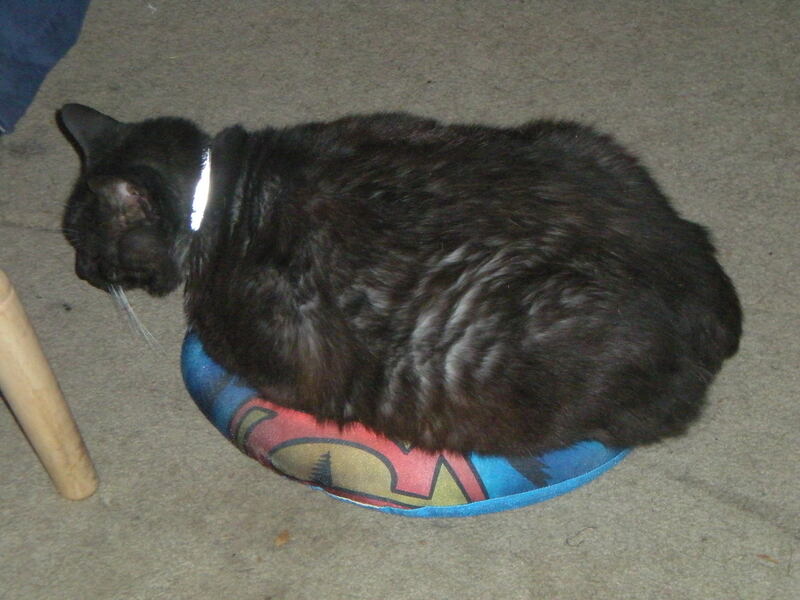 Bluto loves anything like this to drape his fur puddleness onto. 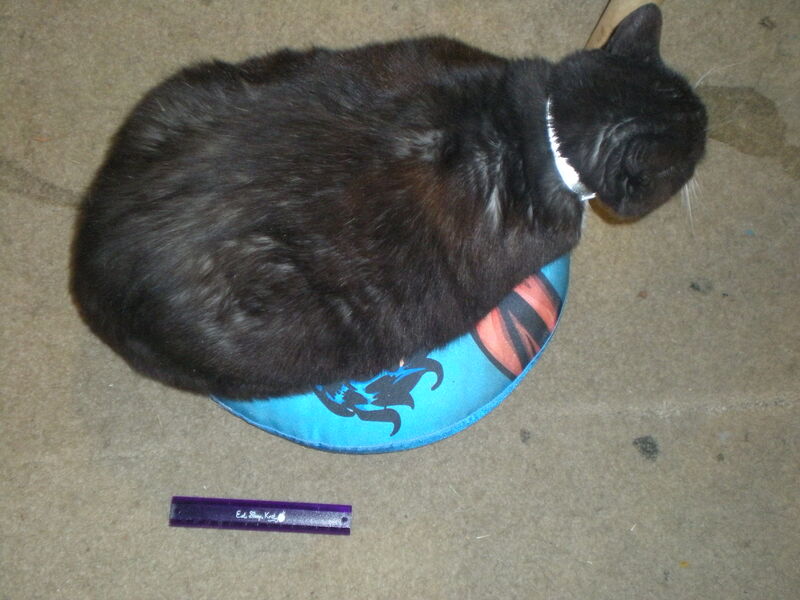 That little purple thing is a 6 inch ruler (15 cm). Yeah, Bluto’s a fattie and he sheds like mad, along with the 2 black & white dogs, Boris & Natasha. So Franklin, don’t be surprised if’n you find some black and white fur in yer hat.